Kerry's Quilting: The Geese are done! 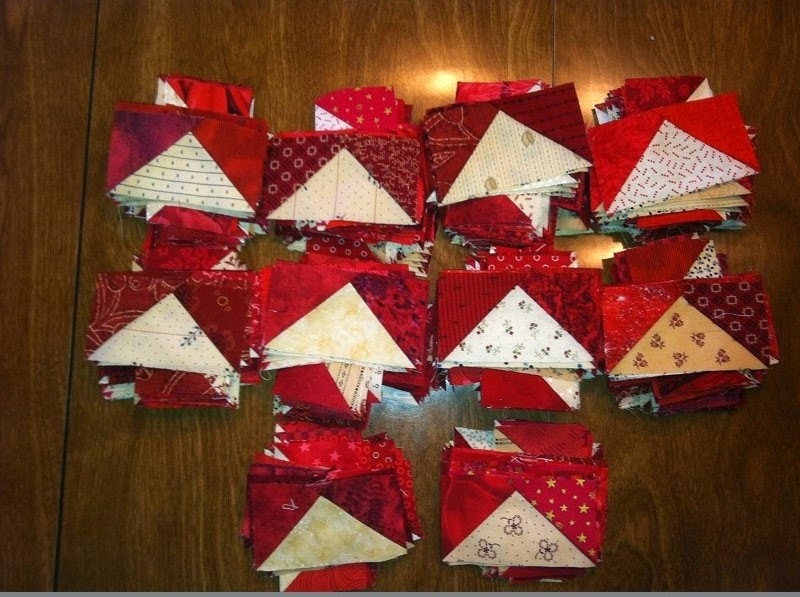 Below are the 456 flying geese for the Talk'n Turkey Quilt. Each stack has 50, with the two smaller stacks at the bottom having 28. They have taken me the last 3 days to complete and my arm is very sore from all the squaring up with the rotary cutter. Glad these are done! The next element that I will be working on will be the string blocks for the border. All other pieces are cut and ready for assembling. That will have to wait until I return home from Sacramento. Hope you are working on something fun and getting in some sewing time this week! Sorry about your soreness! I'm trying to figure out if your stacks look like my stacks. Without counting it seems like mine is larger than yours...I hope I didn't over achieve!